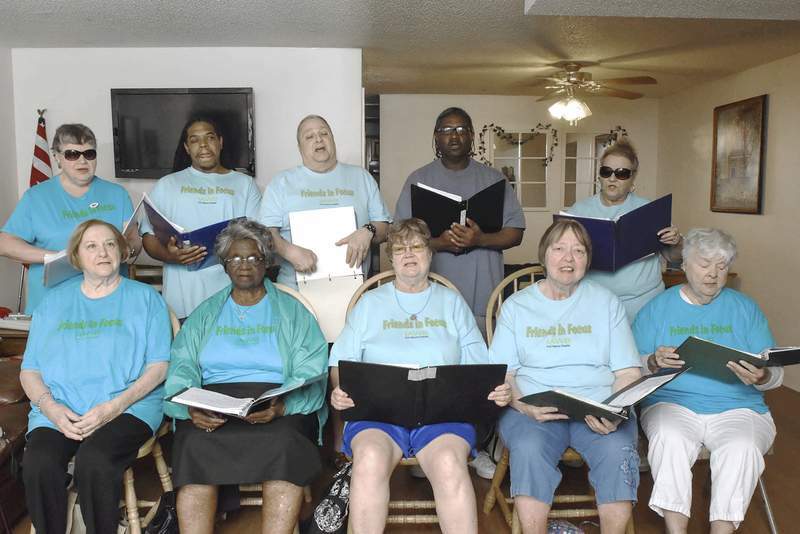 Michelle Davies | The Journal Gazette Friends in Focus, an a capella chorus composed of blind and visually impaired singers, will perform the national anthem for the TinCaps game at Parkview Field on Saturday, then sing at Make Music Day on Tuesday at Freimann Square. The Friends in Focus Chorus has a big gig planned for Saturday, co-founder Nancy Ake explains. The a capella chorus composed of blind and visually impaired singers will be performing the national anthem before the TinCaps’ game at Parkview Field. "Everybody asks me if I’m nervous with all the people, and I say, ‘It doesn’t make a difference to me, because I can’t see them,’ " Ake says frankly. "We just get up and we sing." The national anthem is just the precursor to the Friends in Focus performance for Make Music Day on Tuesday at Freimann Square. Known as an international day of celebration, Make Music Day is free and open to the public with national sponsor Sweetwater Sound providing interactive instrument demonstrations and two performance stages. The chorus will perform 12 songs, mostly patriotic and pop standards, during their 30-minute set. Entering their fourth year, the chorus is looking to add more community performances to their schedule. And the best part, Ake says, is that Make Music Day will be the day before her birthday. "I’ve been telling everybody, I have friends who have little children, that there’s going to be band equipment to try out. That there are things for all ages, and if they have any music in them, it’s going to come out," Ake says. "Everybody has music, whether they can sing or not." Jen Lock, Sweetwater public events coordinator, says her goal for this year’s event was to include more venues into the day’s schedule. Performances will continue into the evening at SevenGen, The Dash-In, The Brass Rail and Calhoun Street Soups, Salads and Spirits. SevenGen and CS3 will have a lineup of all-ages performances, while the The Dash-In and The Brass Rail will be for ages 21 and up. Last year, Sweetwater became a national sponsor of the Make Music Alliance, making the local celebration an official event. Lock says she put her focus into providing more of the opportunities that are available in more than 700 cities across the globe. "My goal this year was to get Fort Wayne kind of in the same format that the other cities are in and spread it throughout the city rather than just one location," Lock says. "Everybody that I spoke to was very receptive. Everybody that I approached, even if they didn’t end up hosting, was really excited about the idea and want to get involved in the future." Lock says the event at Freimann Square will feature more than 10 hands-on activity tents, including a new music technology tent, a jam zone and a kids craft area for constructing instruments out of recycled materials. Participants will also have the opportunity to play ukuleles, a hammer dulcimer, guitars and participate in a drum circle every hour. Performances throughout the day include Secret Mezzanine, the Alicia Pyle Quartet, Trichotomous Hippopotamus, Soft and Heavy and Sophia Slates. "It’s about reaching different audiences and highlighting the different musical abilities and types of music that we have in our community," Lock says. "With some bands, if you’re not 21, you don’t get to see them because they only play at bars, so it’s a cool opportunity to see all types of music." Ake, a singer and musician for most her life, lost her sight at the age of 59. She says she is completely blind in one eye and severely visually impaired in the other. She is now vice president of Indiana Association of Workers for the Blind. She struck up a conversation with board member Rich Poncin while he was vacationing in Florida about how both had been in choirs and about forming a blind a capella choir when he was back in Fort Wayne. "By the time he got back, I had the choir members all formed and ready for him," Ake says, laughing. "My philosophy is if we can bring a smile to one person’s face, then I know we did our job. We formed the choir to give back to the community, because of the community helping us."